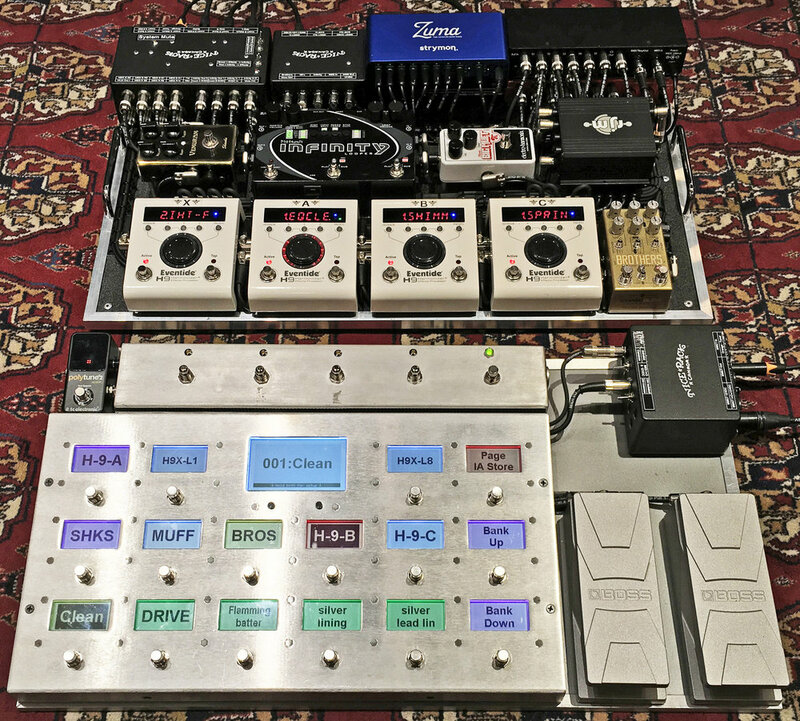 Nice Rack Canada recently built a 2 Board Pedalboard System for Windsor/Toronto based project “I Hear Things” guitarist Andrew Barlow. The system is split into the “Controller Board” & “Audio Board”. The Controller board features RJM Music MasterMind GT-16 serial #1, and 2 BOSS FV30’s modified to 10kΩ Linear Expression Pedals. The unique External Switch enclosure was fabricated by the client & wired by us. The Audio Board applies MIDI control to the entire Audio Path. For songwriting & soundscaping purposes, the client wanted the Looper placement to be switched between the Start & End of the Signal Chain. To accommodate this we built up a Stereo Order Reverse circuit using 3x DPDT relays with remote MIDI switching. Signal Order Reverse Circuit Output --> System Mute --> Left & Right Amplifiers. System power provided by Strymon Zuma & Ojai Expander. The entire system with cabling packs into a Pelican 1650 rolling case for ease of transport. The controller board is connected to the Audio by 1x 7 Pin XLR for MIDI In & Out + 12VDC, and 1x 3 Pin XLR for Tuner Connection. The 7 Pin Jacks in the In & Out Connection boxes on both boards are parallel wired to 3x 3 Pin XLR jacks. This "just in case" feature allows the client to use Standard Microphone Cables to connect the 2 boards in the unfortunate event of the 7 Pin XLR cable being lost or stolen. The Audio Board's MIDI In & Out Box features the Nice Rack Canada to Chase Bliss Audio MIDI Adapter, and a rehoused versions of MIDI Solutions Quadra Thru & Relay. No matter what your system's functional criteria is, Nice Rack Canada can translate your wishes into sonic reality.